**Tax not included in nightly rates** Check in time is after 3:00 PM and check out is before 11:00 AM. An early check-in or late check-out is available for a fee. All properties are non-smoking. By state law, occupancy may not exceed what is posted for each home. Maximum occupancy includes infants and children. Due to security reasons, software and or files may not be downloaded by guests on any in-home computer. and children. Additional daytime guests are limited to a maximum of 4 and must depart prior to 10:00 PM. House parties and/or large gatherings are strictly prohibited. Noise: The City of Santa Fe has a 24hr/day noise ordinance that the city strictly enforces. Guests must keep the volume of voices and music to a reasonable level and bring conversations indoors after 10:00 p.m.
Trash: All other garbage items should be bagged, tied closed and placed only in your vacation rentals trash bin or recycle bin. Please contact your management company if the bins are full. Parking: Please do not exceed the designated amount of parking provided on the property. Do not block neighboring driveways or use others parking spots and maintain access for emergency vehicles at all times. Please contact or message us in advance of booking to make sure this home and our policies are compatible with your group and intended use. No Neighbor Disturbances - This rental agreement includes a Zero Tolerance Policy for noise disturbances, over occupancy or house parties. Violations will result in fines up to three (3) times the rental amount, rent and deposit forfeiture and immediate termination of occupancy with no refunds. construction noise or any other items out of our control. Please do not proceed with booking if you are not comfortable with these policies. Guest agrees to read and abide by the Terms of this agreement and ensure all other occupants abide by these terms. As consideration for the booking and use of Vacation Rental Property during the lease term, Guest agrees to pay Manager for all items specified. 1. RESPONSIBLE PARTY: Guest is an adult at least 21 years of age and will be an occupant of Property during the entire reserved period unless other arrangements are approved in writing by Manager. Guests and all occupants' valid government issued I.D. must be presented upon request. Guest assumes responsibility for actions of all occupants. No keys or entry code will be issued to anyone who is not an adult at least 21 years of age. Any reservation found to be obtained under false pretense will be subject to forfeiture of all payments and deposits and the party will be required to vacate the property immediately. 2. CANCELLATION: Should Guest wish to cancel their reservation, the notice of cancellation must be in writing and Guest is responsible to verify receipt and confirmation in writing from Manager. - For notice received more than ninety (90) days prior to the check-in date, Manager will refund 100% of payments received, less 25% of the rental and tax amounts. - For notice received less than ninety (90) days prior to check-in date, Manager will refund 100% of payments received, less 50% of the rental and tax amounts. - For notice received less than sixty (60) days prior to check- in date, Guest will be liable for 100% of the contracted amount and tax less cleaning fees and Vacation Rental Damage Protection. - There are no refunds for early departures, delayed arrivals, construction activity, inclement weather or reduction in the number of nights reserved for any reason. Trip cancellation insurance is highly recommended. If the Property becomes unavailable or unsuitable for rent for any reason whatsoever, including but not limited to, casualty loss, construction, noise, physical deterioration, or loss of utility services, the Managers liability will be limited to the return of all monies paid on account at the time of cancellation by the Manager. In the event Manager cancels the reservation; Manager will attempt to substitute the Property with a like-kind. All monies received will be refunded to Guest within 7 business days of confirmation of notice of cancellation. 3. TERMINATION: Manager or its agent has the right to inspect and photograph condition of the premises without prior notice at any time to enforce the terms of this agreement. Should Guest or any occupants violate the terms of this Agreement, Manager may impose fines up to three (3) times the rental amount, and may terminate Guest’s occupancy with no refunds of rents or security deposits, and Guest shall waive all rights to due process for failure to vacate the premises upon termination. Guest is notified that all individuals occupying the Unit will be subject to immediate eviction procedures under State law. Manager or its agent may enter the premises and remove Guest, the members of Guest's party, and their belongings. Noise disturbances or use of the unit for any unlawful purpose including, but not limited to the possession, serving, or consumption of alcoholic beverages by persons less than 21 years of age, house parties or keg parties, beer pong, or use of common areas in a manner contrary to the provisions of this agreement, or the rules of the homeowner’s association, are prohibited. IF NOISE COMPLAINTS, OVER OCCUPANCY OR CONTRACT VIOLATIONS OCCUR, OR IF LAW ENFORCEMENT IS DISPATCHED TO PROPERTY DUE TO DISTURBANCES OR ILLEGAL ACTIVITY, GUEST AND ALL OCCUPANTS ARE SUBJECT TO IMMEDIATE EVICTION WITH NO REFUNDS GIVEN. 4. RENTS AND PAYMENT TERMS: 100% of the total amount due is collected at the time of booking. Accepted forms of payment are Visa, MasterCard, American Express and Discover. Initial payment must be made with a credit card. If credit card is declined, the reservation is not valid. Rates are subject to change and no refunds are given in the event advertised rental rates are reduced. If a discrepancy arises between information or rates quoted verbally, on the website, email or otherwise, the rate on the reservation will prevail. In the event incorrect information or rates are quoted due to a typographical or other error, Manager shall have the right to refuse, cancel or limit any reservations listed incorrectly, whether or not a reservation confirmation has been sent. alternative method of reimbursement within 48 hours of notification. The VRDP does not cover missing items or damage from pets or allergy/flea/smoking remediation. 6. RESERVATION TRANSFERS: Should Guest need to transfer the reservation to a substitute Guest, substitute Guest must be approved by Manager and agree to all current terms and conditions. A $150 transfer processing fee shall be applied to the reservation. 7. CHECK IN: Check in time is 3:00 PM. Keys or entry code will be provided once all fees and charges have been collected. If for some reason, the home is not ready for check-in you will be notified. Please do not attempt to check-in or visit the home prior to notification that the home has been cleared for check-in. Please notify Manager upon arrival so we may ensure the Property is to your satisfaction. 8. CHECK OUT: Check out time is 11:00 AM. There is no holding over. PRIOR WRITTEN APPROVAL IS REQUIRED from Manager for late check-out. Cleaning and maintenance are pre-scheduled, so adhering to the Check-Out Time is very important. A $75 hour fee will be charged for each hour (or portion thereof) past the required check out time and Guest will be liable for any additional damages incurred, but not limited to the cost of supplying alternative accommodations for arriving guests. a) Any debris, rubbish and discards removed from the home. b) Dishes and cooking messes cleaned up. d) All remote controls left in plain sight. e) Refrigerator and unit should be left clean and free of perishable food. f) Lounge chairs equipment, etc. put back in place. g) BBQ cleaned with brush. h) Please turn-off lights, heater, air conditioner, fans, appliances, etc. i) Please make sure all doors and windows are closed and locked. k) If unit equipped with a lock-box, please return keys to the lock-box. The cleaning fee is for a standard cleaning only. If the home was left in poor condition and additional cleaning is required, fees will be charged to Guests credit card on file at a minimum rate of $50 per hour. A $25 per item fee will be charged for each lost key and $75 for each garage door opener and remote control that is damaged or not left at the Property upon check-out. 10. OCCUPANCY: Guest understands and agrees that Property shall be occupied by no more than the number of individuals (including children and infants) indicated on the website, and day/evening guests are limited to 4 persons. A minimum charge of $100 per day per person may be imposed for excess occupancy. All day/evening guests must vacate the premises by 10:00 p.m. Should Guest wish to entertain or have more than 4 guests; Guest must obtain pre-approval by Manager in writing. 11. AMENITIES: The property is fully furnished, and includes ready-made beds, 1 set of bath towels per guest and an equipped kitchen. Furnishings and amenities are not new and may exhibit signs of wear and tear. Amenities and furnishings are subject to change, and may or may not be the exact same as represented due to replacement, substitution or other reasons. Manager provides a starter kit of soaps, dish detergent, shampoo, toilet paper, paper towels, and other dispensable items. Since a limited supply is provided, Guest should plan to shop to replenish these items if necessary. Manager assumes no responsibility for the quality or contents of any food products left on the premises and Guests use and/or consumption of same is not recommended and shall be at Guest's own risk(s). Towels and linens are not to be taken from the units. 12. TELEPHONES: Telephones are not customarily provided. If provided, Guest agrees to reimburse Manager for long distance telephone calls or pay for any long distance or collect calls occurring during the reservation dates. Emergency medical, fire and police service can be called by dialing 911. Please verify with Manager if a land line is necessary or you are concerned with cell phone signal strength. 13. DISTURBANCES: Guest and their guests shall behave in a civilized manner and shall be good neighbors, respecting the rights of the surrounding neighbors, and shall not create noise or disturbances that interfere with the quiet enjoyment of their property. Outdoor noise, or noise carrying outside from inside the home should be kept to a minimum regardless of the hour and in compliance with the local Noise Ordinance. 14. GUEST'S NOTIFICATION RESPONSIBILITIES: Guest shall call or email Manager upon arrival to property to confirm arrival. Upon arrival, Guest agrees to examine the Unit, all furniture, furnishings, appliances, fixtures and landscaping, if any, and shall immediately report to Manager if any are not in operating condition or in disrepair. Guest also agrees to immediately notify Manager of any occurrences that may cause damage to Property or adjacent units and to take reasonable measures to mitigate damage, and be responsible for damages for failure to do so. Guest acknowledges that unless Manager is notified on day of check-in of any damage or cleaning concerns, Guest will be liable. Any and all damages, breakage, lost or missing items on the Property during the occupancy will be Guest's responsibility and must be reported to Manager and paid prior to departure. 15. MULTIPLE HOME RENTALS: Should Guest or acquaintance of Guest rent another property in proximity to Unit, no items shall be moved from home to home. The majority of occupants from two or more rentals will not spend the bulk of their rental time at a house other than the house in which they are sleeping (violation of the occupancy rules). Having too many guests in one house creates extra wear and tear, risk of sewer problems and noise complaints. 16. GARBAGE: Guest shall dispose of all waste material generated during the rental period in a lawful manner and put the trash in the exterior trash bins provided for pickup. See the Guest Information Binder in the unit or contact manager for garbage collection days. Guest is cautioned not to leave trash outside for long periods of time because it attracts pests. 17. SUBLEASING: Guest shall not sublet the property. 18. SMOKING: No smoking is allowed on the premises. If smoking does occur on the premises, Guest may be evicted and is financially responsible for all damage caused by the smoking including, but not limited to, stains, burns and the cost of odor remediation and removal and replacement of damaged property. 19. PETS: Pets are prohibited unless otherwise noted and a signed Pet Addendum has been submitted in advance of occupancy. If an unauthorized pet is found on the premises, Guest may and/or pet may be evicted and Guest is responsible to remedy any and all pet damages and the cost of remediation, including pet allergen remediation, flea remediation and reimbursement to Manager for any refunds necessary to relocate or compensate for relocation of future guests until remediation is completed. 20. TRANSIENT OCCUPANCY: Guest expressly acknowledges and agrees that this Agreement is for transient occupancy of the Property, and that Guest does not intend to make the property a residence or household. 21. OWNERS PROPERTY: Guest agrees not to access the owner's storage area, even if unlocked, which contains owners personal property and may contain cleaning supplies and chemicals that could be hazardous to children and adults. 22. FIRE EXTINGUISHER: The property is equipped with a minimum of one (1) fire extinguisher. It is the duty of the Guest locate fire extinguisher, notify all other occupants and guests of the location, and to inform management immediately should the fire extinguisher be missing, or be less or become less than fully charged. 23. SMOKE DETECTORS/ CARBON MONOXIDE DETECTOR: The property has smoke detectors and a carbon monoxide detector installed and they are believed to function properly at the time of rental. Guest will notify management without delay if detectors are missing, uninstalled, "chirps" or have a low battery condition. 24. PARKING: Guest is advised that in many high density beach communities, parking is at a premium and garages and parking spaces can be smaller than normal. Guest is advised to ask for measurements if parking is needed. No refunds will be given if vehicles do not fit in designated spaces. Please verify dimensions of spaces and vehicles. 25. SECURITY: Guest shall see to their own and to the Property security by locking doors, windows, garage doors, etc. when it's prudent to do so and always when all guests are absent or the property is vacated. 26. NEW LOCKS OR ALTERATIONS: Guest shall not make or permit to be made any alterations to the Premises or change or add any lock without prior consent of Manager. 27. LOST ITEMS: Manager shall bear no responsibility for lost, stolen or abandoned items. Every reasonable effort will be made to contact the Guest for return. There will be a minimum $25.00 handling charge plus shipping costs for any found items returned at Guest's request. Manager shall not be held liable for condition of said items. Any items not claimed for longer than 30 days may be donated or sold. 28. TV/CABLE/INTERNET/SATELLITE: Services are provided as a convenience only, and are not integral to this agreement. No refund of rents shall be given for outages, content, lack of content, speed, access problems, lack of knowledge of use, or personal preferences with regard to service. 29. 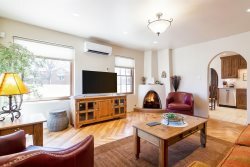 AIR CONDITIONING / HEATING: Most rentals are not equipped with air conditioning. If so equipped, and if not regulated otherwise, Guest agrees that Air conditioning shall not be set below 68 degrees and heat shall not be set above 78, and that the fan setting shall be "Auto". Doors and windows shall be closed when either heat or air conditioning is in operation. There are no refunds for lack of, or malfunctioning HVAC units. 30. POOL AND SPA: If so equipped, spa heating and pool heating, unless solar equipped is an additional fee and must be paid for prior to use. Guest agrees not to tamper with spa heat controls or manipulate heater in any way. spa heat shall not exceed 104 degrees. Guest understands that the area surrounding spa may not be fenced or secure. Guest also understands and agrees to be responsible and liable and will pay Manager upon request for any damages that occur to the spa and its support equipment through misuse and/or negligence. 31. SYSTEM(S) / FURNISHING / AMENITY FAILURES: In the event the rental unit sustains a failure of a system, including but not limited to water, sewer, septic, electrical, gas, plumbing, mechanical, appliances, heat pump, ventilating, pool, hot tub or other system or structural systems, furnishings or amenities, Manager will make every reasonable effort to repair or replace the failed system or equipment, and in such event, Guest agrees to permit Manager or its service provider to have reasonable access to the property to inspect and make such repairs. Neither the property owner nor the Manager shall be liable to Guest for damages, and no refunds will be given for such failures. 32. NOISE AND NOISE TRANSMISSION: Guest is aware that Unit is located in an urban area and it is therefore subject to noise from nearby residences/businesses/traffic and or construction. If Unit has common walls, ceilings or floors, noise may travel between and cause disturbance to Guest from other residences. 33. OTHER OCCURRENCES: Manager does not accept liability for any loss or damage caused by but not limited to the following: weather conditions, natural disasters, pests, construction disturbances, acts of God, or other reasons beyond its control. There shall be no refunds of rents because of shortened stays, ruined expectations, or departures due to work and family emergencies, unavailability of any or all parts of the Unit, or any other reasons. It is highly recommended that Guest considers the purchase of travel insurance. 34. SALE / LEASE OF PROPERTY: If unit is actively listed for sale or lease, Manager may notify guest to schedule and show property. 35. WAIVER OF LIABILITY: for spa, hot tub, Jacuzzi, whirlpool, pool, sauna, pond, decks, railings, etc. herein referred to as Special Feature. If so equipped, it is the Guest's responsibility to learn about safety precautions concerning swimming in or being around Special Feature. Guest understands that the area surrounding Special Feature is not fenced or secure, and there are special risks that may be involved for anyone, in particular children who are not carefully supervised, person(s) intoxicated, on any kinds of drugs or medication, with health risks, or if pregnant. Guest agrees to explain the risks of the presence and use of Special Feature to all guests at the property. Guest agrees to instruct all guests on premises to not access any off-limit, or unsafe sections of the property including roof-tops. Guest agrees to assume all responsibility to make aware all occupant aware of risks and for the consequences of those risks and to be fully and solely responsible for any accidents that may occur. Guest agrees to waive any claim whatsoever against property owner or Manager for accidents or claims. 36. RESERVATIONS ARE NOT FULLY GUARANTEED: If for any reason, the Property is not available or becomes unavailable or uninhabitable for the reservation dates, every effort will be made to locate substitute accommodations. If the substituted property rents for more for the same period, or remaining period respectively, Guest will have the option to pay any additional charges or cancel the reservation within 72 hours of notification of Guest by Manager. However, if the substitute property rents for less for the same period, the difference will be refunded to Guest. In any event, the sole remedy for any perceived damages, liability, or inconvenience is a full refund of the rental amount upon Guest cancellation. It is highly recommended that Guest considers the purchase of travel insurance. 37. AGENCY: It is mutually understood and agreed that Manager is acting as Agent only for the property owner and has no liability to either party for the performance of any terms or covenant of this agreement. Furthermore, Guest understands Manager is being compensated in this transaction by the property owner and is contractually obligated to protect the interest of same. Manager hereby discloses to Guest that should Guest elect to purchase travel insurance protection or damage insurance through Manager, Manager may be compensated by provider(s) for cooperation in the transaction. 38. HOLD HARMLESS: The Guest and all occupants shall hereby indemnify and hold harmless the Manager and property owner against any and all claims of personal injury, property damage or loss arising from use of the premises regardless of the nature of the accident, injury or loss. Guests also expressly recognize that any insurance for property damage or loss which the Landlord may maintain on the property does not cover the personal property of Guests, and that Guests should purchase their own insurance if such coverage is desired. 39. ADDITIONAL TERMS AND CONDITIONS: The undersigned, for himself/herself, his/her heirs, assignors, executors, and administrators, fully releases and discharges Manager and Owner from any and all claims, demands and causes of action by reason of any injury or whatever nature which may have occurred to the undersigned, or any of his/her occupants or guests as a result of, or in connection with the occupancy of the premises and agrees to hold Manager and Owner free and harmless of any claim or suit arising there from. In any action concerning the rights, duties or liabilities of the parties to this agreement, their principals, agents, successors or assignees the prevailing party shall be entitled to recover reasonable attorney fees and costs. 40. WRITTEN EXCEPTIONS: Any exceptions to the above mentioned policies must be approved in writing by a Manager in advance. 41. DISPUTES: Any disputes under this Agreement shall be governed by and interpreted in accordance with the laws of the State of New Mexico action relating to this Agreement shall be filed only in the Santa Fe County court in New Mexico in which county the Unit is located. Both parties consent to the exclusive venue and jurisdiction of such court. Guest agrees to pay all reasonable costs, attorney's fees and expenses that shall be made or incurred by Manager enforcing this agreement. 42. Facsimile signatures are deemed original signatures and approving online terms and conditions constitute approval of the terms and conditions. 43. CREDIT CARD AUTHORIZATION: Guest agrees to provide Manager with a valid credit card for the duration of the reservation. Guest is providing the credit card as a guarantee. Guest certifies that he/she has read and agrees to abide by the terms of this agreement, and agrees to pay and authorize Manager to charge any rental amounts, taxes, security deposits, extra cleaning, missing property and any damages not covered under the Security Deposit Protection (Paragraph 3) and fines or charges pertaining to violations of the rental agreement. Guest understands that all credit card sales are final. Should manager be unable to recover costs from the credit card on file, Guest is responsible to provide an alternative method of reimbursement within 48 hours of notification. 44. ELECTRONIC CONSENT: By checking the box and clicking on the "I AGREE" button, Guest is consenting to the use of an electronic signature in lieu of an original signature on paper. Guest has the right to request to sign a paper copy instead. By checking the I AGREE button, Guest waives that right. After consent, Guest may, upon written request to Manager, obtain a paper copy of the electronic record. No fee will be charged for such copy and no special hardware or software is required to view it. Guests agreement to use an electronic signature for any documents will continue until such time as Guest notifies Manager in writing that you, Guest, longer wishes to use an electronic signature. There is no penalty for Guest withdrawing this consent. Guest should always ensure that Manager has a current email address on file in order to contact Guest.